The NAFLDsym modeling software is a mechanistic, mathematical model of nonalcoholic fatty liver disease (NAFLD), which can be used to predict efficacy for treatment modalities developed for NAFLD and nonalcoholic steatohepatitis (NASH). The NAFLDsym modeling software has been utilized to evaluate a number of compounds from several large pharmaceutical companies, supporting clinical trial design optimization and clinical development decision making. DILIsym Services, Inc. applies the NAFLDsym modeling software in proprietary services projects by performing simulations of compounds to evaluate and model their efficacy and other effects on key characteristics related to NAFLD. NAFLD is a prevalent, worldwide disease with few available treatment options. Accumulating lipids within the liver cause steatosis and impose lipotoxicity upon hepatocytes that can lead to declining liver function and ultimately liver transplant. Bringing effective treatments rapidly to market is paramount to improve patient health. QSP modeling has been demonstrated to accelerate clinical development, and we anticipate NAFLDsym will contribute to accelerating the clinical development of effective treatments for NAFLD patients. 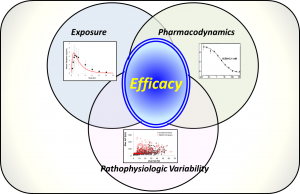 NAFLDsym will employ the QSP modeling practices of combining predictions of compound exposure with the pharmacodynamic characteristics of a compound and how they can produce efficacy across a range of patients with pathophysiologic variability. DILIsym Services, Inc. has significant expertise in the areas of drug-induced liver injury (DILI), quantitative systems toxicology (QST) and has employed this expertise to develop and apply DILIsym to evaluate the safety risk of numerous drug candidates. DSSI also has significant experience in the area of metabolic diseases and has leveraged this area of expertise to develop the quantitative systems pharmacology (QSP) modeling software, NAFLDsym v1A. DILIsym Services, Inc. applies this modeling software to assist with clinical development in collaborative partnerships. NAFLDsym v1A is focused primarily on the mechanistic underpinnings associated with steatosis and lipotoxicity within the liver. Inflammation and fibrosis sub-models are actively being developed and will be added to NAFLDsym v2A. Numerous simulated patients are included in NAFLDsym, representing the pathophysiologic and clinical heterogeneity amongst NAFLD patients. Click here to find out more about how you can take advantage of NAFLDsym through a consulting arrangement with the DILIsym Services experts. What are we providing with NAFLDsym? How is NAFLDsym being applied? These mechanistic components have been combined to generate >300 simulated NAFLD patients in NAFLDsym v1A. 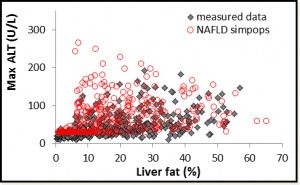 Reflecting the variability in clinical patient populations, these populations of simulated NAFLD patients (SimPops™) have a range of liver fat levels (steatosis), body weight, and many also have liver injury (e.g., elevated ALT). NAFLDsym has been used to evaluate several treatment modalities for NAFLD thus far, which included predictions of efficacy for each in the NAFLD SimPops™. NAFLDsym can be used to evaluate targets and/or specific compounds; the compounds can be simulated by utilizing key laboratory and/or clinical data describing DMPK and pharmacodynamic characteristics. These QSP approaches with NAFLDsym can enable pharmaceutical companies to prioritize compounds and targets. 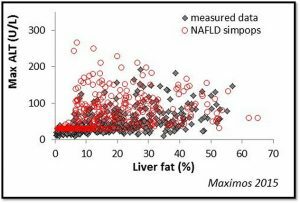 Additionally, NAFLDsym can be used to optimize clinical trial protocols by determining favorable dosing paradigms and outcome (i.e., liver fat reduction) measurement frequency. DILIsym Services, Inc. is now working towards building upon the success with NAFLDsym v1A and expanding the capabilities in future versions to include pathophysiologic contributions from inflammation and fibrosis. Join your peers around the world and begin working with NAFLDsym to generate the insight you can’t measure to make better decisions.